“We saw a fine parade of Empire lines and silk sheaths, and by far the most impressive array of natural greens since Linda Blair showed off the highlights of her supper in The Exorcist. There was peppermint, aquamarine, verdigris, iceberg, eau-de-nil, and a lemon-and-lime special from Marc Winningham. There were pinkish grays so soft and subtle that onlookers were reminded of the furring found on unclean kettles. Then there was Susan Sarandon’s Dolce & Gabbana ball gown, a sort of one-night stand between chocolate and bronze; it exactly matched the hue of her hair, though which came first was a matter of urgent debate. You’re right, Tori: Way too much information. Read the full review of Mommywood. Tori’s mother, Candy Spelling, is also a 2010 Delete Key Awards finalist. This is the first time two members of a family have made the shortlist in the same year. The Delete Key Awards are being named in random order, beginning with No. 10, but numbered for convenience. This is finalist No. 7B, which tied with No. 7A, Tori Spelling’s Mommywood, for this spot. The winner and runners-up will be announced on March 15 on One-Minute Book Reviews and Janice Harayda’s Twitter page (@janiceharayda) at www.twitter.com/janiceharayda. “Celebrities get way too much attention and credit,” says Candy Spelling, the widow of the producer Aaron Spelling and the mother the actress Tori Spelling. Should we respond by skipping her memoir? 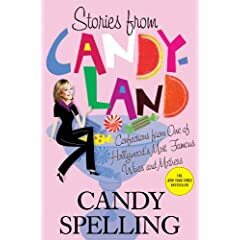 A review of Spelling’s Stories from Candyland will appear tomorrow on One-Minute Book Reviews.